REVIEW – I am normally an early riser by nature and will often wake up before my alarm clock even goes off. However, there are those occasions where I apparently needed the extra sleep and was glad I did have an alarm clock set to make sure I got up on time. I had recently replaced an alarm clock I had been using for literally over a decade with a new alarm clock. Much to my disappointment I found that the alarm was so high pitched I did not hear it in the morning (I wear earplugs at night, but that is a whole other story!). So when the opportunity came to review the new iLive Voice Activated Clock with Amazon Alexa I jumped on it. Let’s see if it worked for me and made sure I was out of bed on time. The iLive Voice Activated clock is exactly what it is named. 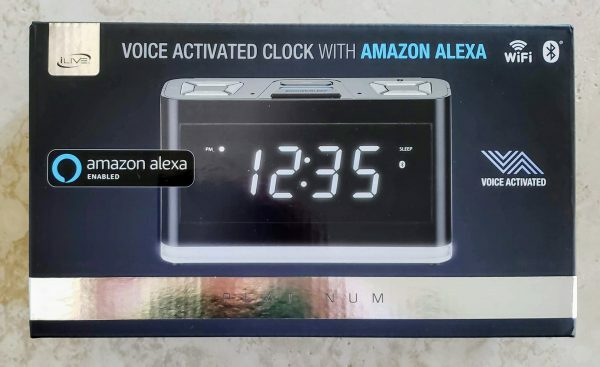 It is a voice-activated clock that works with Amazon Alexa. You can give it voice commands like any other Amazon Alexa enabled device as long as you have signed into your Amazon Alexa account through their app. You can tell it to set alarms, cancel alarms, ask it a plethora of questions, play music and play Audible books. 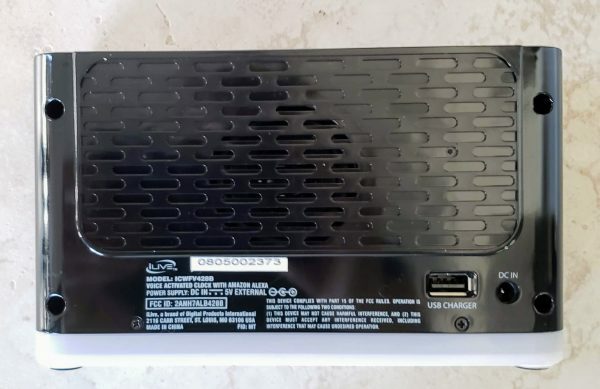 It has a really nice speaker that has both left and right channels on it and it gives a much better sound than any other Amazon Alexa device that we have in the house. We have the original Echo, Echo Dot, and the newer Echo Show. In the picture above you can see what comes in the box. You get the clock radio (the light colored band at the bottom is the night light). 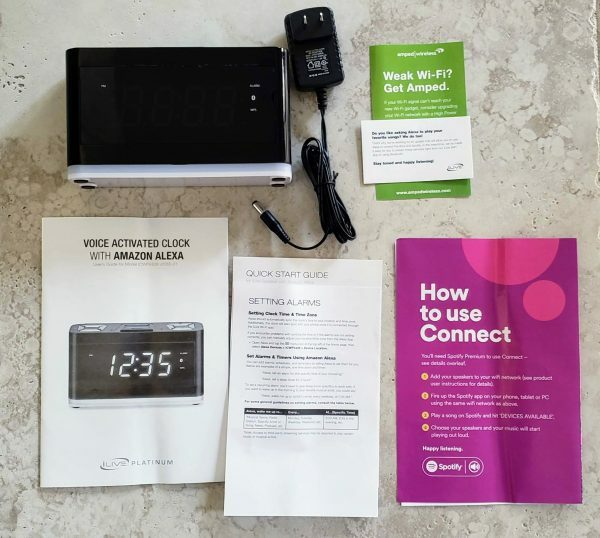 You also get an ac adapter, an advertisement for a WiFi booster service, instruction booklet, quick start guide and an advertisement for Spotify Premium. In the pictures above you can see my original alarm clock on the right and the new iLive alarm clock on the left. The iLive is definitely larger but still does not take up a lot of space on my bedside table. The next two pictures below show images of the top and back of the device. There are a lot of buttons on this alarm clock. Many of the buttons have dual features as you can see. Starting from left to right on the left picture the top button is the power button. I found this particular button rather deceiving. When I plugged the clock in, it immediately lit up and displayed 12 am which made me think the clock was on. I was unable to begin the configuration process until I pressed the power button and the light bar between the light and snooze button started blinking. Also worth noting is once the clock is all set up and connect to your WiFi, if you were to lose power and have it come back on, the device will self-power back on after 2 minutes. It sits with the 12 am display and will eventually start to self-search for its WiFi connection. If it finds it, it will display the proper time again and pull back any alarms you set from Alexa. So no battery backup is necessary. Going clockwise the next two buttons let you control music playback manually on the clock itself. The bottom button will control the LED clock display brightness (only 2 settings – light up the whole room and only slightly less light). The last button on the left will let you pair with Bluetooth or a WiFi protected set up device. In the middle, you have the light button that will let you turn on the night light at the bottom of the clock. There are three levels of brightness for that. The big button at the bottom is the snooze button. To the right, you have a microphone mute button if you don’t wish to have Alexa listening to you. The plus and minus buttons control how loud the alarm and how loudly Alexa responds. The bottom button with the microphone picture is just a manual button you can press to activate Alexa if you don’t want to call out her name first. In the back of the unit is a USB port in which you can charge your phone and a DC in port for the power adapter. I did note that when I plugged the USB from my wireless charger for my Galaxy S9 that it did not have enough juice to support fast charging. The next series of pictures show you the process to get the clock connected to your WiFi. 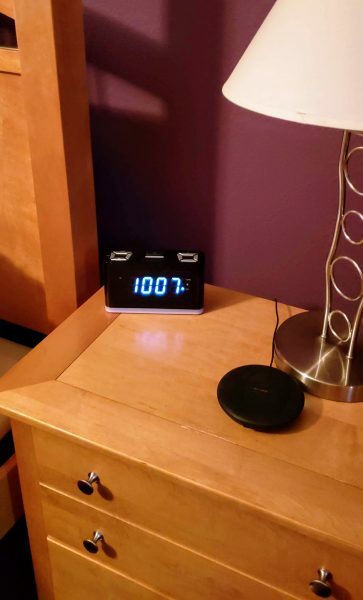 It is a pretty standard setup where you actually connect your phone directly to the WiFi coming out of the clock itself then provide the clock with the home WiFi password. Once connected you get the opportunity to name the device. Then you proceed to connect to your Amazon Alexa account. You give the app permission to access the Alexa voice service. You even get the choice of specifying which language in which you want Alexa to speak to you. Once I was through all of that I was then prompted for a firmware upgrade for the device which I did apply. A nice feature which I mentioned earlier is the microphone mute button. If you really don’t want Alexa listening in to the fun you are having in your bedroom you can mute her. The next few screens show the plethora of playing options provided by the app to the clock. I personally did not have any of those streaming accounts available, but I did have the clock read my Audible book to me. I have to say I was really impressed with the sound that came out of the device. It had a great base quality and was very clear compared to our existing Echo devices. I love that it connects to Amazon Alexa. We are a big Echo use home. We own five existing echo devices, so using this clock came very naturally for me. Just before going to bed telling Alexa to set an alarm for the next day is so easy. You can even tell her to set the alarm for all weekdays if you like. Alexa also now gives you the ability to set multiple alarms if you have two people using the same clock. When it goes off you can talk and tell Alexa to stop the alarm or press a button on the clock to stop it that way. I love that I do not have to remember to replace batteries in the clock to handle the battery backup issue. That is also a con which you will see below. The speaker on this clock is amazing for its size. I often use it when I bring a load of clothes into the bedroom to fold. Listening to music or a book certainly makes that job go much faster. I really think that the clock could benefit from an actual battery backup. A possible weak spot is that this clock is very dependent on WiFi in your home. If you WiFi goes out, your alarm will not go off. Another weak spot is if you wake up before the alarm goes off you only have two choices to cancel the alarm. One is to talk to Alexa to cancel the alarm which can be loud for the other person still sleeping in the room. The other is to open the Alexa app and cancel that way. It would be awesome if there could be some way to configure a manual button press to cancel the alarm before it goes off. Another issue is also dealing with the power issue. If the power goes off in the middle of the night and comes back on, the clock will reconnect with your WiFi if your WiFi is available. However, it is a noisy process with the clock talking and giving you a status along the way. I would rather it do that soundlessly so it would not wake me up in the middle of the night. My last issue is a pet peeve with pretty much all newer alarm clocks. Dang those LED displays are bright. I see people complaining that even the lowest display setting is still too bright for a dark room. This clock is still pretty darn bright. I will most likely be buying a film to place over the display to hopefully dim that sucker down. All in all, I really do like this alarm clock. It will stay on my nightstand and become my personal alarm clock. Fortunately for us we rarely lose power so the backup issue is not that big of a deal. I just really love the sound that it produces and I can actually hear the alarm in the morning. This alarm clock has found a permanent home on my nightstand. I do have some film over the clock display to dim down the brightness, but otherwise I have loved using it so far. I always set my alarm by asking Alexa and cancel the alarm by either manually cancelling it through the Alexa app or by telling Alexa to cancel it. I use it to control the lights and ceiling fan in my room. I basically took away the Amazon dot that was on my nightstand and gave me more space. The only thing I could see that would replace it in the future is to have the same clock with a wireless charging pad built in. I have seen one by iLive that has the pad but not Alexa. Source: The sample for this review was provided by iLive. Hate to think that you will need a UPS for this. You don’t need a UPS. When the power comes back on it will automatically reconnect to your WiFi assuming your WiFi has come back up. The one situation where you could run into a problem is if you ran out of power just before the alarm would go off. Knock on wood, I have never been out of power at that time of day. If you are talking about the colon between the hours and minutes then yes mine does. It is showing the second. There are 60 flashes between each minute.